Exporter of a wide range of products which include coloured bowls, lightweight besan bowls, stainless steel bowls type 2, stainless steel bowls type 4, stainless steel bowls type 6 and stainless steel bowls type 7. 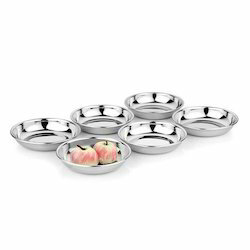 Serve some delicious food items to your guests on any occasion using the food bowls. Suitable for all kind of table decor, the variety will simply leave you stunned. Offering durability and class, these bowls are a must-have in your kitchen. 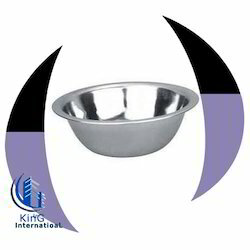 Crafted using stainless steel, this bowl from King International is sturdy and long lasting. Owing to its steel construction, the bowl is fully rust resistant. 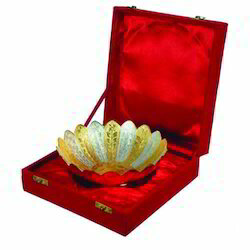 Sporting a classy coloured exterior, this bowl will surely garner appreciation from your guests. You can use this bowl to serve snacks at an evening get together or for main course during dinner. This bowl will be an ideal addition to your dining décor. 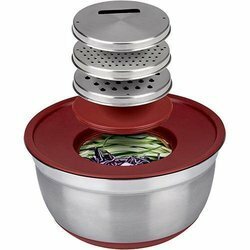 Serve some delicious food items to your guests on any occasion using the food Belly Dabba. Suitable for all kind of table decor, the variety will simply leave you stunned. Offering durability and class, these bowls are a must-have in your kitchen. 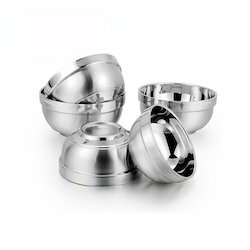 We are the prominent manufacturer, exporter and supplier of Stainless Steel Color Bowl, these are manufactured from high grade quality material. These are highly in demand for their unmatched quality and unbeatable price. 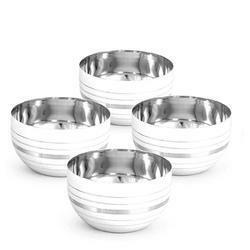 We are manufacture, supplier and exporter of Export Bowls that come with smooth finish and extra shine. In addition, this product range is offered in various specifications to meet the diverse requirements of the clients and at market leading prices. 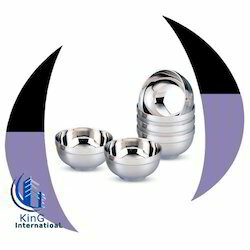 We are manufacturing and supplying Stainless Steel Capsule Bowl to our esteemed clients. We are providing this in bulk quantity as per client's requirement. We are manufacture, supplier and exporter of Footed Bowl those are available in various shapes and sizes. 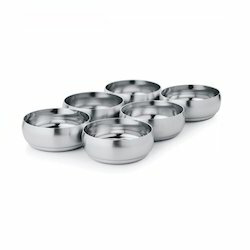 These bowls are used in household, hotelware catering services etc for different use. In addition, this product range is offered in various specifications to meet the diverse requirements of the clients and at market leading prices. We are prominent manufacturer and supplier of Steel Bowl with Plastic Lid. In addition, this product range is offered in various specifications to meet the diverse requirements of the clients and at market leading prices. 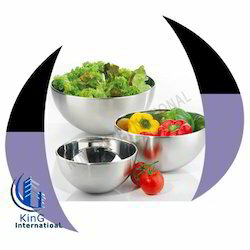 Crafted using stainless steel, this bowl from King International is sturdy and long lasting. 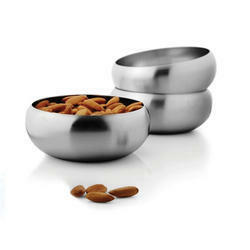 Owing to its steel construction, the bowl is fully rust resistant. Sporting a classy coloured exterior, this bowl will surely garner appreciation from your guests. 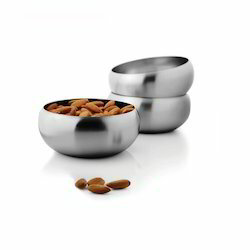 You can use this bowl to serve snacks at an evening get together or for main course during dinner. This bowl will be an ideal addition to your dining decor. Offering a wide range of Steel Dinnerware Bowl to our valuable client in different specification to meet the diverse requirement of client. 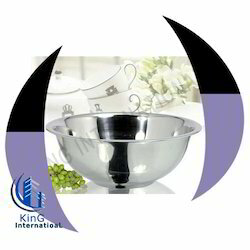 Crafted using stainless steel, this bowl from King International is sturdy and long lasting. Owing to its steel construction, the bowl is fully rust resistant. Sporting a classy coloured exterior, this bowl will surely garner appreciation from your guests.This bowl will be an ideal addition to your dining decor. We are manufacture, supplier and exporter of Lid Bowls to our most valued clients. 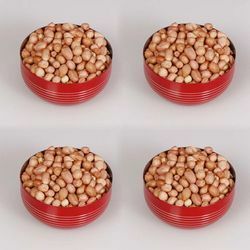 Our assortment of Lid Bowls are made by using superior quality raw material which ensure its durability. We are manufacture, supplier and exporter of Deep Mixing Bowl to our most valued clients. 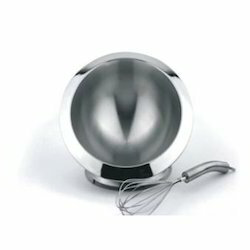 Our assortment of Deep Mixing Bowl are made by using superior quality raw material which ensure its durability. Our offered product is manufactured using high grade factor inputs and advanced technology as per the set industry standards. Due to its unmatched quality and attractive designs, this product is widely used for commercial as well as residential purposes. We also offers Deep bowl, Deep mixing bowl, mixing bowl, bowl, stainless steel bowl, steel bowl, regular steel bowl, D.M bowl, kitchenware bowl. 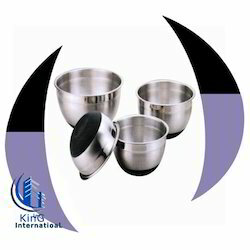 We are providing Regular Steel Bowls to our esteemed clients which can be availed in diverse designs, sizes and shapes as per the requirements of our clients. We are manufacture, supplier and exporter of Plastic Lid Bowls to our most valued clients. Our assortment of Plastic Lid Bowls are made by using superior quality raw material which ensure its durability. 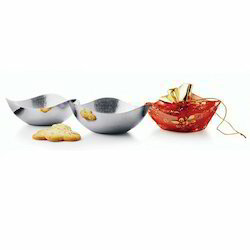 We are providing Deep Besan Bowls made of Stainless Steel. It is available in various thickness, can be done light or heavy as per the requirement. 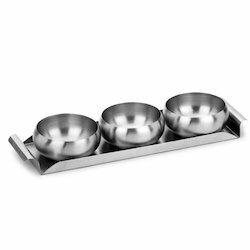 King International presents designer stainless steel serving platter. 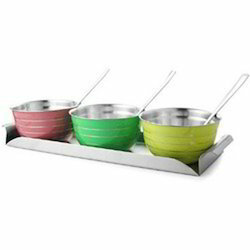 The platter consists of tray, bowls and spoons. It is available in various sizes, shapes and colours. It can be customised as well. 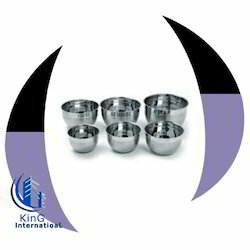 King International presents designer stainless steel serving platter. It is available in attractive colours and silver touch design. 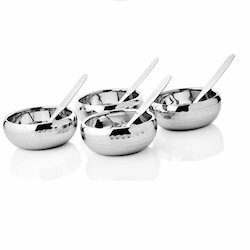 The platter consists of tray, bowls and spoons. It is available in various sizes, shapes and colours.